The safe voltage monitor PNOZ s60 completes the safety relay PNOZsigma product group and fulfils the requirements for the implementation of SLS applications as prescribed by law in the USA. 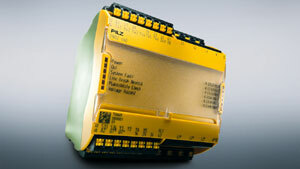 PNOZ s60 monitors de-energised 1-phase or 3-phase supplies with neutral conductor. Two switching thresholds can be set: 12 V or the 6 V common in the food and beverage sector. The safety circuit is not enabled until the value is below the configured switching threshold. With a supply voltage of 24-48/110-240 VAC/DC the safe voltage monitor PNOZ s60 is particularly flexible and can be used in a wide range of applications. Expanded diagnostics via LEDs increases productivity as it enables users to perform simple diagnostics and supports them when troubleshooting. The compact 90 mm width enables a space-saving and therefore cost-effective installation in the control cabinet.